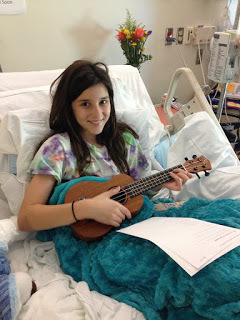 UKULELE equals happiness, so what better way to use the instrument than to cheer up seriously ill kids? 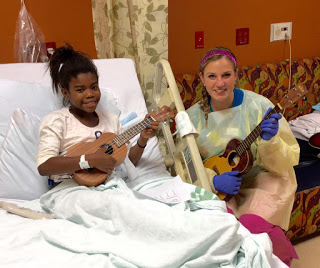 KAMUKE reports on the fantastic work being done around the world to introduce ukes to children’s hospitals. WHEN children hear music, they come alive. Have you ever met a three-year-old who didn’t like to dance? It’s human nature, it’s innate, it’s the reason The Wiggles are multi-millionaires. But sometimes horrible things happen and kids end up in hospital, where their childhood is at least temporarily replaced with tiresome tests, scary scans and a myriad of medication. Enter the ukulele. 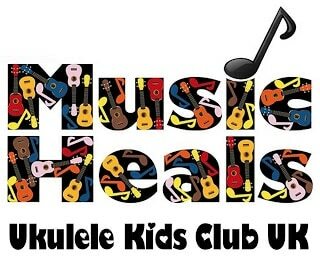 Founded in Miami, USA by Corey and his wife Edda in January 2014, the Ukulele Kids Club’s mission is to donate ukes to children’s hospitals for music-therapy programs. Of course, music therapy itself is nothing new. Hippocrates is believed to have played music to his patients as early as 400BC, although he probably wasn’t strumming a Kamaka. Something else that’s global is the UKC. The organisation now has a UK branch, with further expansion in the works. So how have the Brits responded to the idea? While there isn’t an Australian arm of the UKC just yet, the Starlight Children’s Foundation is flying the four-string flag Down-Under. Established in 1988, Starlight brightens the lives of seriously ill kids and their families by replacing pain, fear and stress with fun, joy and laughter. “Music is a big part our Captain Starlight and Starlight Express Room hospital programs,” says Jono Brand, Creative Director of the Captain Starlight Program. 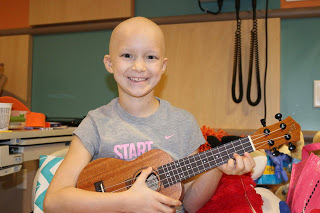 “Hospitals can sometimes be a scary place for children and music is a great icebreaker, connector and entertainer. Jono recently experienced first-hand what a difference music can make in a difficult situation. “A Captain Starlight recently entered a room on a hospital ward. As soon as we parted the curtains, we felt the tension,” he tells us. “A four-year-old patient was in bed, curled up in a ball around her teddy, quietly weeping. Dad stood with his arms crossed, looking out the window. Mum sat beside the bed, staring at her phone. Both looked exhausted and empty. Captain Starlight started strumming her uke and began singing The Lion Sleeps Tonight. “It’s hard to articulate how the mood changed, but it did. It wasn’t immediate; a gentle change. Dad uncrossed his arms, the girl sat up in bed, Mum reached for the hand of her child. By the end of the song, the room felt warmer. There are currently more than 100 Captain Starlights across every state and territory in Australia and there are plans for more. And more ukes, too. Naturally, there are challenges when it comes to catering to children of varying ages. And it’s not just the kids who are getting something out of the movement. Corey tragically lost his young son to a viral disease and starting the Ukulele Kids Club has helped him deal with his tremendous loss. “It’s all about healing,” he says. “It helps me feel like I’m doing something good. When I play music with those kids, I get that fulfilment and it fills that void. It’s been so joyful and so much fun. For more information, check out theukc.org, uk.theukc.org and starlight.org.au.